You can't deny it'd be a conversation starter every time your guests walked in to find the metallic skeleton-head of a giant killer robot staring back to them, its glowing red eyes boring into their very souls. I mean, what else would you use a Terminator's head for? This giant replica of the T-800 features the design from the upcoming Terminator: Genisys, and is 1:1 scale, so it's considerably large. 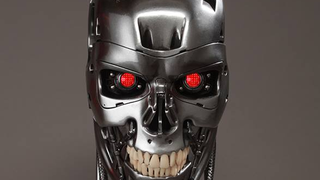 Aside from being a big ol' hunk of Robot skull, the Terminator's eyes also light up. Because just what you need is the glowing eyes of a Terminator dimly illuminating the room at night. Aside from pictures of the bust, Chronicle also released comparison pictures between the new T-800 design and the classic version seen in Terminator 2. It's actually interesting to see the subtle changes to the design over the years. It's largely stayed the same, but there's a very subtle size decrease between The T2 and Genisys designs, as well as a slightly toning down of the detailing to make it look slightly sleeker. It probably speaks to the iconic stature of the T-800 design that even after all these years, it's not shifted around much. But seriously, even as a Terminator fan, I'm not sure where or why you'd want this. There's something rather macabre about sticking a big ol' head on your mantle, especially a weirdly skeleton-esque one that gurns back at you with a full set of teeth. An iconic movie design, sure, but still really bloody creepy as a knick-knack on your shelf! Interested? Pre-orders for the bust go begin next Tuesday, the 24th on Chronicle's website, where your giant robo-skull will set you back $500.